Members and friends of Lodge of Tranquillity No 3877 gathered in the Geoffrey Hirst Masonic Suite in Woolton Golf Club to celebrate a glorious golden jubilee of the WM Alan Samuel Carter. Kevin Poynton (left) presenting Alan with his certificate. The lodge was opened in due form and after the usual business had been conducted, Provincial Deputy Grand Director of Ceremonies Mark Barton announced that Assistant Provincial Grand Master Kevin Poynton was without and demanded admission. Kevin, accompanied by grand and acting Provincial grand officers entered the lodge and were duly welcomed by Alan. As is the custom, Alan offered Kevin the gavel, which he accepted with great pleasure, thanking the lodge and Alan for allowing him to be part of the evening’s celebration. Kevin opened by saying that it was important for us all to make a daily advancement in Masonic knowledge and that in making that advancement it wasn’t all about ritual but about meeting with others in a happy and convivial atmosphere. No matter where you go or what you do any celebration is worth very little unless it can be shared with others. Kevin then provided the lodge with Alan’s life story – or as much as could be told in open lodge! Alan Carter was born to Sam and Katie in 1937. Sam was a policeman and Alan’s mother was a shorthand typist and they lived in south Liverpool where Alan attended Booker Avenue County Primary School. Alan achieved his 11 plus aged 10 and in August 1948 he joined the Liverpool Institute High School for Boys, leaving when he was aged 15. During his time at the school he joined the CCF (Combined Cadet Force), a training school for potential officers and his choice in the cadet force was the RAF section. To this day he still attends old boys’ dinners both Masonic and non-Masonic. Soon after joining the institute, Alan went for an audition with the choir master Ronnie Woan and after only singing two notes he had passed the audition and joined the Liverpool Cathedral Choir, which had a profound impact on his life, taking up a considerable amount of his out of school hours as he had to attend four services and four rehearsals each week. The first broadcast service that Alan took part in was the memorial service for the famous Liverpool born comedian Tommy Handley after his death in 1949, following which he also took part in services for other events, such as the Festival of Britain, royal visits, civic occasions and Remembrance Sundays. Kevin discovered that Alan had met several VIPs and at this point circulated copies of a photograph taken with Viscount Lord Montgomery. Alan could not remember the occasion but we were informed that also standing with the boys was a great friend of Alan’s, Howard Jones. As head boy, Alan played a part in the preparations for the coronation of Her Majesty Queen Elizabeth II in June 1953. Unfortunately, only a month before the great day Alan’s voice broke! Consequently, he then joined the Cross Guild, which was a group of former choirboys who took part in ceremonial duties and other processions. One of his last duties of any significance was in 1967 when he carried the Civic Cross at the enthronement of Bishop Blanch, who later became the Archbishop of York. Alan had told Kevin during a previous conversation that one of his tutors had told him, ‘not to be a teacher, there’s more money in accountancy’. Therefore, after leaving school (and the choir) in 1953, he joined Chalmers Wade & Co, Chartered Accountants in Fenwick Street, Liverpool. In the following two years he also played football for the Liobians (Liverpool Institute Old Boys) as a goalkeeper. In October 1955, just six weeks after his 18th birthday, Her Majesty ‘invited’ Alan to join her Royal Air Force for a couple of years. Unfortunately, she never sent him abroad, so after basic training he served 19 months as a storeman at RAF Trimingham in Norfolk, being promoted to corporal in February 1957. Alan told Kevin that he had been tipped off, that if anyone ever asked you what newspaper you read you were always advised that the answer should be the Daily Telegraph. However, he let the side down, for on one occasion a senior officer paid a visit and asked that very same question and almost ran out of the building when he answered the Daily Mirror. Being on national service wasn’t all square bashing and bulling, there were some other avenues of interest that Alan managed to find and turn into good ideas. One such idea came to him in 1956, when due to the Suez Crisis, petrol had become rationed and it was a requirement that all vehicle fuel tanks were topped up, even after a short trip. The fuel was always invoiced in full gallons, so if a garage only entered it as 4.5 gallons, they would still charge for 5. Consequently, Alan always took a petrol can with him and as the odd half gallon was already paid for he wasn’t about to let them keep it! Alan Carter (left) and his gifts, including a mounted silver spitfire, with Alan Sale. Alan still remains an active member of the National Service (Royal Air Force) Association and has been attending several gatherings as well as two parades each year, the high-light being the service and march-past at the Cenotaph on Remembrance Sunday, as well as having attended the Festival of Remembrance at the Royal Albert Hall the previous day. Next July, Alan will be one of only 10 of the members chosen to attend the Festival in Westminster Abbey to mark the centenary of the Royal Air Force. Alan is also currently the treasurer of the RAF (West Kirby) Association and is still a member of the ‘Not Forgotten’ society which is the club for the Tri–armed forces. After national service Alan entered into Articles with Chalmers Wade & Co. This was to be the start of six years hard study, but the hard work paid off. He was awarded the certificate of merit, coming 12th out of over 2,000 in the November 1960 intermediate examination and was also awarded the Liverpool Society Prize in the November 1963 final examination, where his name still remains on the honours board to this day. After qualifying, Alan became responsible for the audits of several Liverpool shipping companies and also the Roman Catholic Archdiocese of Liverpool. He was also a part-time lecturer for final year accountancy students at the Liverpool College of Commerce from 1964 to 1969. Alan left the accounting profession in 1965 to spend the rest of his career in industry. However, before leaving Chalmers Wade & Co, like a lot of men in those days, he went to a dance school, in this case the Vernon Johnson School of dance. Alan also purchased his first car in that year, which was a green Morris Minor. A favourite haunt of Alan’s was the dance hall at New Brighton and that was where he first met his future wife Pauline and they were married in January 1967, setting up home in Ainsdale where he still lives. In that time, Alan and his wife have had three children, Karen, Helen and Alan and have been blessed with 5 grandchildren. Sadly, Pauline died in 1983. Alan’s first industrial position was with Selex Electric Co (Kirby) Ltd., in August 1965, retiring in March 2003 as a financial controller in the Hazelwood Foods PLC Group and remains a life member of the Institute of Chartered Accounts in England and Wales. 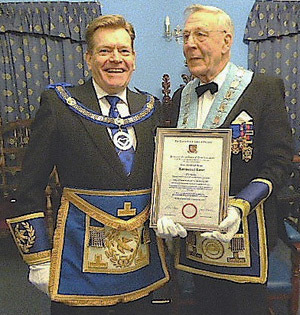 His interest in Freemasonry was ignited soon after joining Selex, when he and his wife were invited to Lodge of Tranquillity’s Ladies Night by the company secretary Chris Ponsonby and the managing director Bert McMath, both men being Masons. Alan was initiated into the Lodge of Tranquillity on 2 January 1968 by Albert Kenwright, having been proposed by Chris Ponsonby and Bert McMath. Alan’s Masonic career began in earnest in October 1969 when he became inner guard, then three years later in October 1972, he was appointed junior warden, swiftly followed by senior warden the following year. In 1974 Alan was installed as master of the Lodge of Tranquillity and the representative that evening was another Liobian, APrGM Cyril McGibbon. After serving his year as IPM, Alan served two years as secretary, one year as ADC and then went on to serve eight years not only as DC but also as a preceptor. In October 1983, Alan’s efforts were recognised by the Province when he was appointed PPrSGD. In October 2009 he was again installed into the master’s chair and in 2012 was promoted to the rank of PPrGSuptWks. Alan is also the fifth past master of this lodge to have been a member of the Liverpool Cathedral Company. In the Royal Arch he was exalted into Ainsdale Chapter No 5884 in November 1982 and went on to become its first principal in January 1990 and then again in January 2016. In April 2013 he was appointed to the rank of PPrAGDC. At this stage, Kevin informed Alan that the PrGM James Anthony Harrison has caused a commemorative certificate to be produced and requested that the group chairman Andy Whittle read it out. After receiving his certificate, Alan presented Kevin with two cheques, one a personal cheque, the other for £25 in favour of the MCF 2021 Festival. Following the first rising, Mark Barton formed the procession to retire, with the celebrant in attendance, whilst Alan Sale took the chair. The lodge was then closed and the brethren retired to the dining room to continue the celebrations. Pictured from left to right, are: Mike Cunliffe (group vice chairman), Arthur Cregeen, Howard Jones, Kevin Poynton, Alan Carter, Andy Whittle, Alan Sale and Mark Barton. 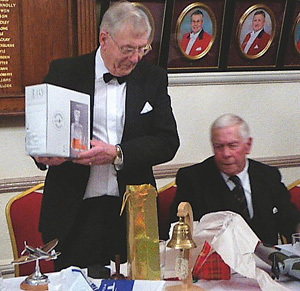 Alan was presented with a mounted model silver spitfire by the brethren of the lodge, along with other gifts. Alas, all too quickly, the evening came to an end with the tyler Tommy Lunt proposing the last toast.